The Cate Agency knows how to drive traffic because we know how to emotionally appeal to the home buyer. We understand that you are the expert at home building and we’ll show you why we are the experts at builder marketing. We listen to you. We learn all about your company so that we can effectively market YOU. We create a plan that addresses your needs AND goals. We build your strategic marketing plan, review it with you for your approval, and closely monitor every aspect once it’s implemented. We’re good at what we do and we have over 15 years of relationships with home builders to prove it. 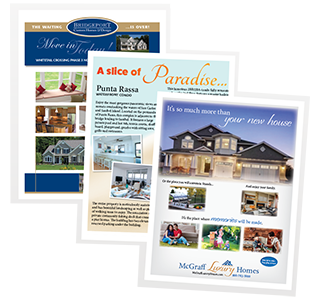 Our advertising and marketing programs work, and they get home builders like you noticed – we’ve even won awards for it! Our Full Service Marketing Program includes everything from Strategic Marketing to Social Media and Digital packages. Working on your account will be a seasoned Marketing Strategist, a highly efficient Account Manager, an awesome Media Planner/Buyer, a super-talented Copywriter, an in-the-know Social Media Coordinator, and a guru of Digital Marketing. Your team works directly with you to make sure that your marketing strategy is consistent, coherent, and completely outstanding. ANYTHING THAT YOU NEED – WE CAN DO! Founder and Executive Director, Catherine (Cate) Foster is an award-winning marketing professional with over 30 years of sales and marketing experience in consumer and business-to-business marketing. As a marketing executive Cate has been recognized for outstanding project management, creative development, and generating strong client returns on marketing investments. Her strong strategic marketing skills have been instrumental in helping her clients strengthen and expand their business because she focuses on helping them create positive company images and generating traffic to achieve long-term growth.